Leave thought and feeling, for just a moment, and just listen with your eyes. Look around. How amazing we are, to be aware. And thus the world becomes amazing once again too. This simple awareness is love unfettered, pure bliss, and needs no product of thought or feeling to give it it’s meaning. We can tell if what we are, in the moment, is pure awareness, or a product of thought/feeling, by looking for the gap of time. Anything produced by the brain, of chemical or reactive make-up, is revealed for what it is by the ever so slight gap between our original perception and the near-immediate reaction, and consequent mind-projection. This projection is usually all of the process we are aware of, and what is usually called reality. All thoughts and feelings are separated from awareness by this slight gap, and thus being in time, are not our true eternal nature. Thinking and feeling is an after-the-fact reaction in the mind realm that has the unfortunate side effect of either being good or bad. Plain awareness is blessedly free of such nonsense. Like an alert idiot, our awareness gratefully doesn’t know any better, doesn’t have a clue if we’ve been bad or good, if we are worthy or worthless, or anything else for that matter. It just is, and as such, so are we. Sooner or later the task of changing our being, of becoming, moves from simple mental learning through advice and association to the inner task of developing the intuition. How well this works is ultimately about how well we can hold tension and work within. The practical thing to “do” then becomes the real time observation of our own attention. The work moves within, and is no longer about character building, a better personality, becoming charismatic or invisible. 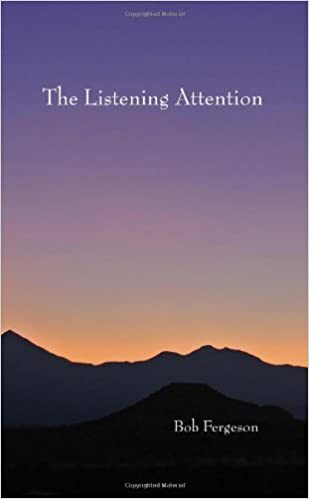 There are several ways to describe this simple trick of watching or chasing your attention: the experiments of Douglas Harding, which show how to look at what you are looking out of, learning to listen with the eyes, to listen with the attention, the two-way seeing or self-remembering of Gurdjieff and the double-pointed arrow of attention, one pointed within, one without, and the art of mindfulness. To be successful in these tricks, we must be able to relax for at least a second from constantly and unconsciously upholding our sense of self. This split second of seeing who or what we really are, is our slipping behind the mind or ego and seeing through it rather than as it. Now, if you have trouble practicing experiments of the type listed above, or are unable to catch the meaning behind them, why is this? What’s blocking you? The ego1-ego2 game is a great enemy in direct seeing. When the exercises are practiced, the ego-mind is rendered quiescent, if only for a split second, but long enough for one to be free from the mind’s pressure to create, project and solve problems, drama, or conflicts, such as getting what you want, avoiding what you fear, etc. But in the next instant after the “seeing” has ended, the mind will rise up and become active once more and the ego-self, largely through memory, will then lay claim to the credit of seeing, dragging us out of eternity and taking away any incentive to actually “see” again. An insidious trick has just been played on us, for the ego, as ego1, has just laid claim to “seeing,” and places all blame for actions opposed to seeing on a fictitious character it creates and then uses as scapegoat: the hapless ego2. Thus, we are taken out of action and thrown back where we started: identified with the mind in time. Seeing is now relegated to memory only, for we are unconscious of the whole above trick. The ego has thus kept its throne, and we, as awareness, are back asleep. Look at a familiar object, say a tree out of your window, and watch the mind as it works. Observe how this mind associates the tree with names, memories, information, etc. Notice how it does this automatically, unquestioned. Now, practice two-way seeing, the listening attention, while looking at the tree. Allow yourself to look back at what you are looking out of, the aware silence, and look forward or out at the object as well. Can you now look at the tree without “knowing” what it is? Without knowing what you are, simply because you are? The mind is now silent and all is okay, for nothing is separate. No separation of things, no creating of things, is needed; no labeling or judging, qualifying or describing. You are not enlightened or ignorant, for you have no need to create yourself or “be” anything. Now, while still observing the tree, allow the mind to work, as it rises up and again starts the process of creating objects with characteristics, separating “you” from the “tree,” and separating the tree from everything else, as the string of associated concepts stream forth. Can you see the difference between these two states? Can you see your attention move between these two views? Can you be honest about this? Does your heart have anything to say about value and meaning in relation to these two very different states? If seeing still makes no sense, and you are at a loss as to practical method and the next move on your path, this then is what you can do: become conscious of what is blocking your intuition. Perhaps going back through your life story with its accompanying emotions is in order, to free you of the energy knots that bind your attention. What needs to be done will be seen, if steps are taken to improve the intuition, clarify one’s values, and to hold and increase the tension of questioning, of looking. Taking advice and direction from outside as an easy way out of the tension of having to develop one’s own intuition ends in robbing one of the grace that comes from within. Only something which has no vested interest in the drama can look outside of the character in its tale, and see the universal reality behind the dream of life. This is a very scary proposition, it threatens the very system of the drama, for we derive our identity from our character and story-line, each defining the other. The drama is seldom questioned, for this can only happen by stepping outside of it; a paradox. We refuse to listen to the voice of the silence within, because that would imply we don’t know it all already. How can we learn to turn to this inner listening, to hear the voice of intuition, of insight? Spending time alone is one way. We take a break from the distractions of our electronic age with its cell phones, computers, TV’s, etc., plus the well meaning but distracting voices of our friends and family. This can give us time to learn to appreciate silence, and to listen. Perhaps we’ll reacquainte ourselves with a long lost companion deep within: our own heart. Time spent alone removes the relentless pressure imposed on us by society to conform to its standards, and allows our mind to clear and become quiet. Another pressure is the ego’s defense against its main fear, the unknown. This also requires much time and energy, and blocks out anything that doesn’t fit the storyline. Nothing from the higher power within is allowed to get through. Another way is to spend time with those who value listening within, and have found their connection to the inner voice. These fellow seekers can save us time and energy, having been down the long road to their inner self and thus able to help us along our path as well. The higher energy fields of these companions will give the inner self a taste of its own potential. Their inner calm and quiet are a stark contrast to the tale of sound and fury we have been dreaming so hard, without question. The world of dreams is similar to this drama we call our life. When in a dream, we take it for real, and the experiences of the dream as telling us a true ‘knowing’ about the dream-world. But when interpreted upon awakening, we see it as only a story of our character’s mind, and this ‘knowing’ as being simply a description of this mind that made the dream-world. The individual pattern or view-point is what’s known. Nothing is objectively known about the so-called things, inhabitants, or possible reality of the dream. To find the reality behind the dream, and possibly behind the dream character, we must find something higher. This universal intelligence is constantly speaking to us, always trying to get our attention. This voice of insight or intuition is drowned out by the voices of the characters in our drama. Look bravely at the plots of the dramas in life you’ve seen. They all end the same, and nothing is gained. Death conquers all, and the story with all its sound and fury, endlessly repeats. Question the character you’ve been lost in, and the drama of your own so-called life and its significance. Search fearlessly to find the nameless Something behind the play; the calm, clear reality beyond the dream, where nothing is done, nobody’s there to do it, and all is perfect in silence. I’m often asked how a seeker can increase their progress along the path. Sometimes the person may feel stuck, or simply wants to know the most expedient way to increase their vector. Looking back over my own life, I’ve found that one factor stands out. When I became a conduit for realization, passing it along to others, things took off. It’s as if we agree to become a link in a chain, and pass on down the line that which was handed to us from above. This is not only a theory, but something we can, and must, actively do in our day-to-day lives. One may argue that if all is one, then this is just another illusion, but the rationalizations of the ego come easy and keep us stuck in our own mud, while active work may put tension on us in a way the ego can’t handle. I can best relate how this works along the lines of my hobby with photography. I’ve spent a lot of my time in the great outdoors, and for years refused to share this experience with others due to a certain ego. I felt that if I took pictures of my trips, it would somehow cheapen the experience, take something away from the purity of the pristine settings. Somehow this changed, thank goodness, and I became willing and inspired to do the work to bring a bit of what I was seeing back with me to share with others. I broke down and bought a digital camera, and the magic began. Some inner part of me that had been denied came back to life, and with it a better relationship to everything involved. The entire experience of hiking was somehow changed for the better. At about this same time, I also bought my first computer and entered the world of email and the Internet. I was able to stay in touch with fellow seekers from around the country, and to share my experiences in the search for definition, as with the photography. Somehow this changed the belief that spiritual work was a solitary affair only, and opened doors of opportunity I had never dreamed of. I started a web site, and became involved with an online confrontation group. I began to move within, the connection was made. William Samuel talks about much the same thing. He describes getting answers from within as Glimpses, and stresses the importance of sharing these. It’s a double-sided coin, much like the chicken and the egg dilemma, in that we must get answers in order to share them, in order to get answers. But the process is not that complicated, if we just make a move. We become a conduit, a transmitter of realization, and the more we give, the more we get. One trap worth mentioning here is that of keeping this all in one’s head. We may think that by getting a few answers in the beginning of our search, we are on the path and need not put out more effort. Being comfortable in our life, we may not wish to rock the boat of our habits, and thus keep whatever intuitions we receive to ourselves, thus miring our spirit in a dream world. Our intuitions bear fruit when they are put into action and tested in life, and when found sound, passed along to our fellows. All of the above is what might be called a law of manifestation, an equation as Samuel calls it, and it will work for whatever desire applies it, spiritual or otherwise. If one wants money, success or security, this formula will work as well. This leads to a dilemma for some us in that we may not consciously know what we really want, until we test ourselves by putting the formula into practice. This can be a paradox. If we believe we want enlightenment, and put it to the test through actions in our day-to-day life, we may find that what we really want is freedom from fear or a desire for power. While we have temporarily fooled ourselves, we have at least come to know ourselves better, and have thus made a move along the path of self-discovery. We may eventually uncover an intense longing for home, for something stable and real, which was only allowed to manifest as the mundane patterns of fear and worldly desire. This was long buried, and is what will provide the necessary pull to carry us farther within. To get real answers, we must come to have real and pressing questions. One thing is for certain, if we do not make a move, a commitment to action, we will not leave the head-in-the-sand false safety of our dreams. A man asleep in his bed in a burning house may dream of oneness and ease as well as anxiety and need. On the other hand, waking up may take effort, be difficult and even unpleasant, but is most necessary, too.